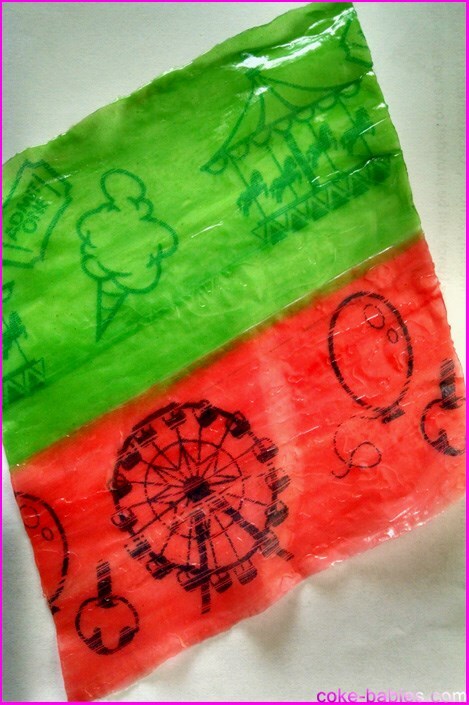 My local Fruit Roll-Up selections have become rather unimpressive, thanks to Blastin’ Berry Hot Colors seemingly being sold only at warehouse stores. Also, Cherry Orange Wildfire needs to be sold in its own standalone box. Buying a ten pack variety assortment, and only getting three of them is a shame. Most new flavors of Fruit Roll-Ups tend to be, “it’s berry, I guess – but in different colors.” You’ll have the occasional outlier, but “new” flavors don’t tend to be too exciting. To combat this, Ms. Crocker has whipped up a new assortment based on common (?) 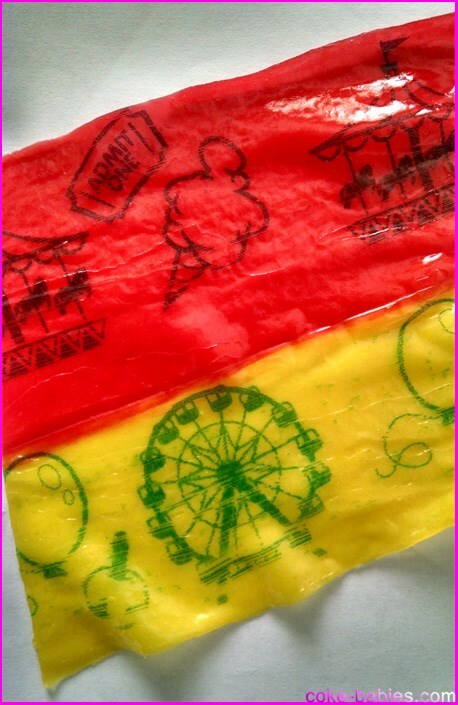 carnival foods. 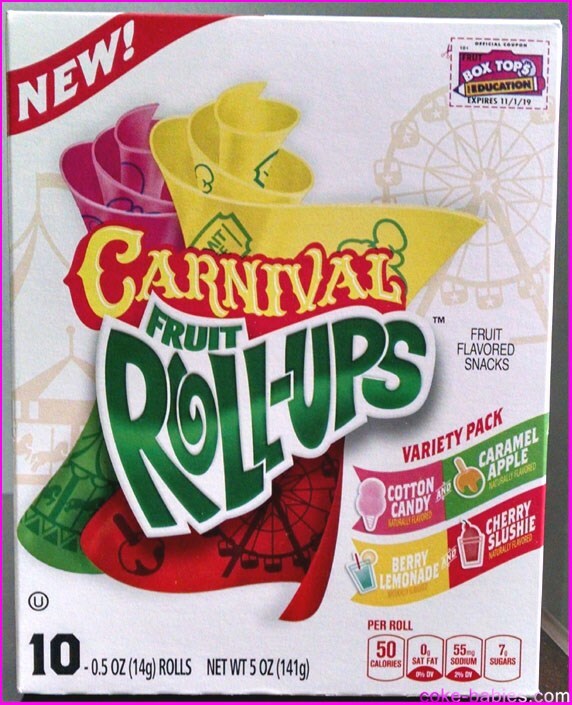 Some of the flavors make sense – Cotton Candy and Caramel Apple – but the inclusion of Berry Lemonade and Cherry Slushie seems more like, “We don’t know how to make Funnel Cake Roll-Ups. Use another food.” Although I’m thankful for the latter two flavors, as they seem far less terrifying a prospect compared to the first two. Apparently, I had failed to notice the “and” between the two sets of flavors, indicating they would be sharing the same Roll-Up. Upon realizing this, Cotton Candy and Caramel Apple seemed even more threatening. Given how much could have gone wrong, Caramel Apple is surprisingly not awful. It’s definitely not good, it’s just not awful. As a flavor, Caramel Apple is usually slightly better than Green Apple, Sour Apple, etc. The caramel smothers the apple enough where the apple flavor’s terribleness still manages to leak through, but just enough to make you say, “It smells awful in here, is the gas on?” Not enough to actually kill you. Cotton Candy didn’t scare me as much, but I wasn’t looking forward to it. Aside from Cotton Candy Bubble Yum when I was in junior high, I don’t recall ever really liking a cotton candy-flavored food. Except cotton candy, I guess. The cotton candy flavor tasted sort of like actual cotton candy, but it was more of an unholy matrimony of Strawberry flavor and… uh, Sugar flavor. While the first pairing of flavors failed to impress, I had higher hopes for the second pair. Cherry is a hit or miss flavor for me – I often get too much of the “cough syrup” aspects of the flavor. And not even in a good way. I mean, cherry Luden’s are literally cough medicine, and they still taste way better than most cherry-flavored candy. Granted, Luden’s cough drops essentially are candy – not using “The candy you can eat in class!” in an advertising campaign always seemed like a missed opportunity. But still – actual cherry candy needs to step up its game if it’s getting outclassed by medicine. Cherry fruit snacks are a significant exception to the ‘eh’ cherry feelings. Most cherry fruit snacks are awesome, because they remind me of Fruit Corners’ Fruit Bars. If you are forgetting them, they are a fruit snack from the 80’s, whose marketing campaign essentially consisted of people screaming when they saw them. It also probably doesn’t help your campaign when you have the creepy kid from Children of the Corn passing out your product. The Cherry Slushie flavor is basically every cherry fruit snack you’ve had, but with the cherry-ness tuned down a bit. It does read a bit more “sugary cherry snack” than usual. Though I don’t find this to be an improvement on the flavor at all. Berry Lemonade is pretty self explanatory. It tastes like lemonade with a mysterious “berry” flavor in it. Probably blue raspberry, though I could just be assuming that because of the picture on the box. Overall, it’s an okay collection of flavors. I’d buy a box of just cherry and lemonade, but since that’s not likely to happen, this will be a one and done purchase.